I returned from sunny Mallorca yesterday: 30 degree heat meant that I've spent the past seven days in a bikini. Waking up this morning, I put on my favourite red pencil dress, a pair of black courts, rounded off with a camel mac and my Raybans. No tights, no gloves, no scarf. Big mistake! 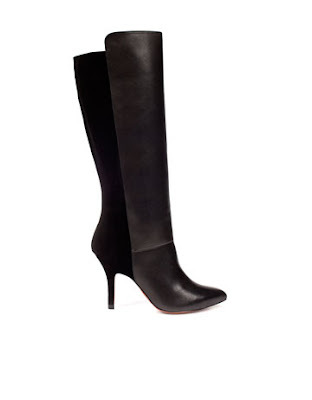 This evening, therefore, was dedicated to restocking my winter wardrobe, which started with these, ahem, practical boots. I know, I know, the suede won't work with the rain/snow, and neither will the heels, but they're just so darn cute. Tomorrow's outfit with be a nod to 60s style icon and star of The Avengers, the gorgeous Emma Peel. Black roll neck sweater, black mini skirt, black tights and the boots. And before bed, I must, must, must dig out the leather gauntlets and chunky scarf. Winter is officially here!